Comments - Fantastic triptych depicting the Battle of Shizu-ga-mine in 1583, where Hideyoshi defeated Shibata Katsuie. 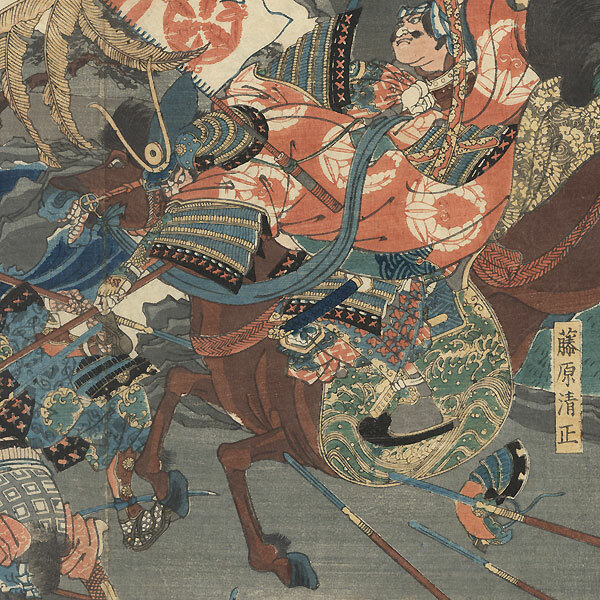 Here Kato Kiyomasa leads his troops in an attack as he gallops headlong into the enemy, piercing an opponent's neck with his pole arm as he rides. 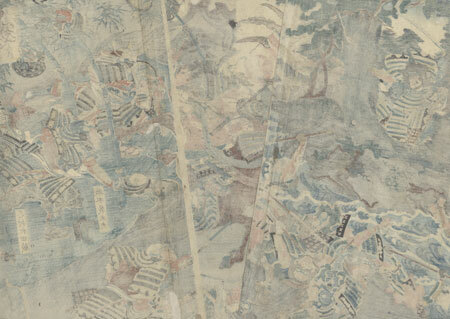 Warriors thrust spears at him at bottom center, while others tumble into a rushing river at left as they are knocked down. At right, in place of battle standards, some of Kiyomasa's men carry bamboo poles hung with the captured helmets of enemies. A great action-filled image, with expressive figures and wonderful detail. A nice subject for a samurai enthusiast. Condition - This print with excellent detail as shown. Three separate panels. Slight separation along vertical fold in each panel, a few holes, repaired. Slight soiling, a few creases. Please see photos for details. Good overall.